Beer may still be the alcoholic beverage of choice for the majority of Asheville-area drinkers, but the rapid growth of the local cider scene has Bold Rock Hard Cider co-founder Brian Shanks and his industry colleagues in high spirits regarding its future. 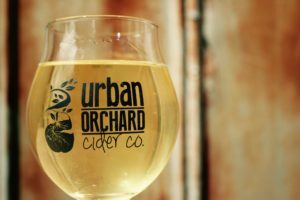 The uptick in interest is so sizable that for the category of Best Brewmaster in the 2016 Mountain Xpress Best of WNC readers poll, the top spot went to Josie Mielke of West Asheville’s Urban Orchard Cider Co. Jeff Anderson, marketing and creative director at Urban Orchard, credits the cidery’s strong local following for its continued success, but also points to the benefits of the local industry’s rising number of cider producers. With large businesses like Bold Rock — whose distribution footprint stretches from Pennsylvania to South Carolina and over into Tennessee — and others more modestly sized, he compares their collective growth and trickle-down effect to that of the local brewery industry. With apple season at its peak, fall is an especially active and invigorating time for Urban Orchard, which produces its entire year’s supply over the course of a few months. Anderson says the cidery eventually plans to experiment with single varietal batches, but for now all ciders derive from the same base blend of Hendersonville apples with specific yeast strains creating the range of flavors. STET ciders’ maturation phase lasts eight to 12 months, meaning that the beverages currently pouring in its taproom were made about a year ago.